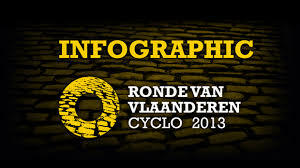 Three of our Flandria Cafe guys are currently in Brugge getting ready for tomorrow's Ronde van Vlaanderen voor Wielertoeristen. Maarten, Tom and Kurt are signed up for the full enchilada - the full distance version - a whopping 259km. No doubt they're harder men than I. Back in 2005, Dr. Brad, Marc and I decided that for working stiffs, 140k with a heavy dose of Flemish Ardennes bergs was plenty. Each of those guys works a full week, squeezes in rides around family obligations, and still manages to eat up the km. This year, doing it all in a tough winter in these parts. Their weekends in prep have been going to early season group Sunday rides, only meeting 2-3 hours before and doing the same ride in advance before doing it again with a group trying to tear their legs off. As i write this, it's 1pm in Flanders and they're likely in the Flemish ardennes battling away. 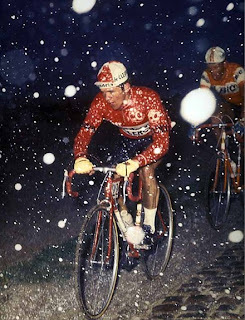 And speaking of winter weather in spring jongens...here's some great photos of the 1975 Ghent-Wevelgem. 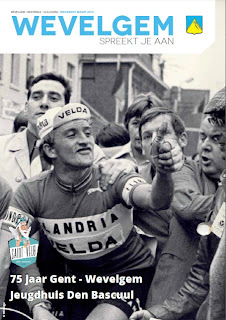 A little old school throwback to whet your appetite for cycling's holy week. It was a year very likely before your time - almost 40 years ago. To me it seems like yesterday though. Back when racing in wool through winter was just what was done. No fuss. Photo of the day: Sneeuw and souplesse. "The winter that wouldn't leave." End of March, and today finally felt like 'spring' rather than winter. Temperature edging up toward 50 degrees F. Still winter jacket, shoe covers, thermal gloves, covered ears and throat. Cold wind. But the sun was fighting through, and I snuck away from the keyboard for a solid 3 hours. 1 hour of it was all hills. Searching for souplesse, forcing myself to gear down and spin it up: Climbing correctly, not forcing it up with brute strength and ignorance. Seeking that light feeling when you're just spinning up and defying gravity. It's something you can't force. You just have to relax, back off and turn the legs, and the rhythm comes. And when it arrives, you know you're on your way. Snow is gone finally though...around these parts anyway. Been a tough winter, but not that bad really. As a barrier to cycling, cold and snow is overrated. Not opinion, fact. Classic coke? Or new coke? You decide. Weekend of contrasts for 'old school' cycling. On the positive end we get the Strade Bianche, and a killer performance by Moreno Moser, a kid I'm fast becoming a fan of. It was a great race to watch. If you didn't catch it, you missed a real classic. Old school. Glad February is behind us. Bring on the Sequester: The USA needs to H-T-F-U as my pals at Velominati would say. And while we're at it, bring on some of that windy spring classic weather. And more daylight. We're ready. It was a tough few months around here to get mileage in. Lots of wind trainer workouts, but too little out on the roads. Weather and work combining to thwart old-school base miles ambitions. This was a winter more like I remember as 'New England normal'...e.g. snow, ice, frigid cold. Flandria Cafe's recently revived wielercafe night at Federal Hill Pizza in Warren RI has been a substitute. Our initial seissun combined world championship level pizza, a massive craft beer selection, and fifteen old school masters, bench racing. Good craic, good for enthusiasm... but a bit detrimental to the 'kg'. end of the watts/kg equation.